Ron Vered (Senior Partner), Shlomit Hess Wortzel (Partner) and Adv. Moriya Vinner represented Peninsula Growth Fund in multiple financing transactions. Ron Vered (Senior Partner) and Ezra Baris (Partner) represented Dan Capital from the Dan transportation group in the purchase of the Sorek desalination project. Ron Vered (Senior Partner), Shlomit Hess Wortzel (Partner) and Orly Kronman (Partner) represented the Senior Lenders in the refinancing of Ashdod Energy and Ramat Negev Energy independent power plants. 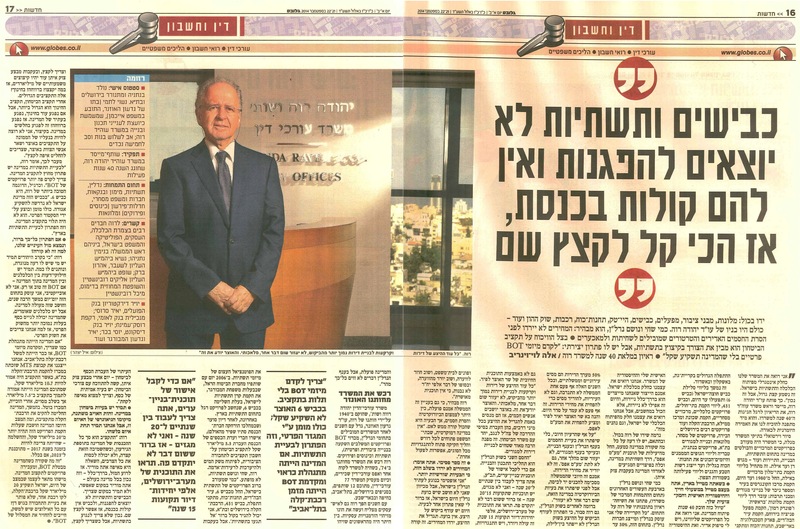 The President of the District Court in Tel Aviv approved the sale of Eurocom’s share in the Midtown Project to Canada-Israel from Eurocom’s receiver, Adv. Chagai Ulman. 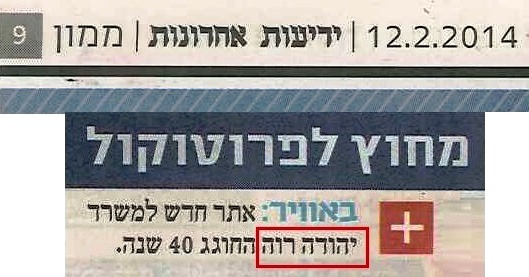 The total consideration to the receiver is 140 million NIS . 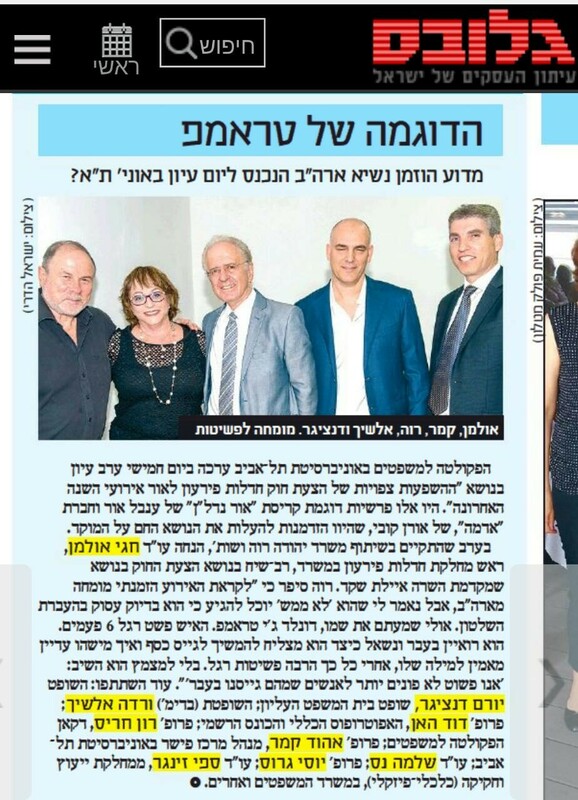 Orly Kronman Dagan (Partner), Ezra Baris (Partner) and Ron Vered (Senior Partner) represented Stern Engineering in the sale of 70% of the Company to Fimi Fund. Adv. Chagai Ulman and Adv. Noa Solomon applied to court on behalf of Ayalon Insurance Company Ltd. and Yesodot A’ Nadlan and Pituach LP against Green Avenue Ave Construction & Development Ltd from Bat Yam to enforce and realize securities upon a TAMA 38 building project. Quotes from Adv. Chagai Ulman’s meeting with students at the College of Management. Adv. Carmit Bar On represented Swandor in a transaction for a long term management agreement of the Princess Hotel in Eilat. Adv. Carmit Bar On published an article on the topic “Tourism Services Law Proposal- a New Law for the Tourism Industry after 42 Years”. 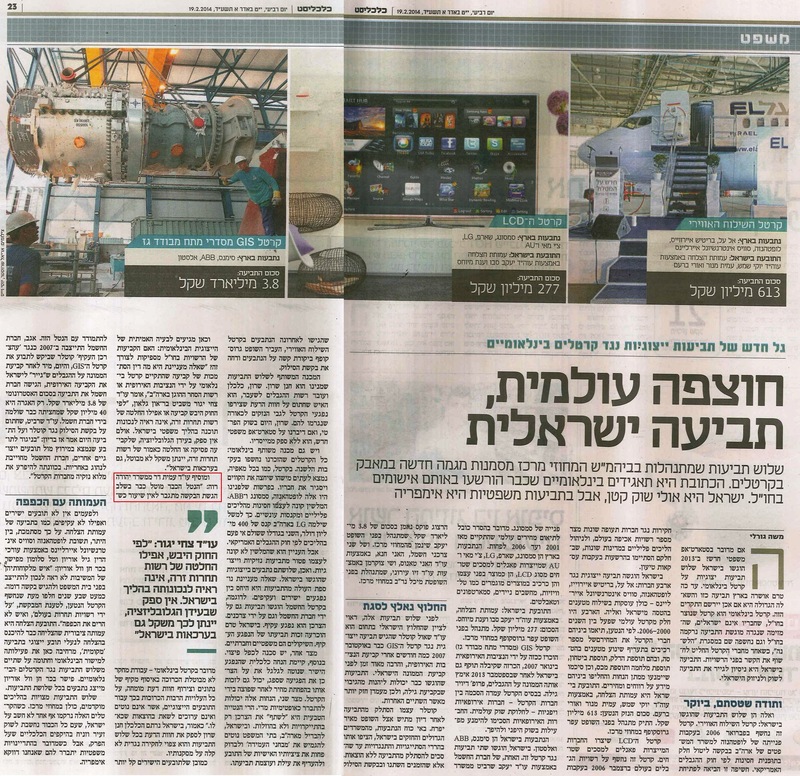 Yehuda Raveh is interviewed by Globes regarding the necessity of the privatization of infrastructure projects for the procurement of facilities for new residential neighborhoods. Adv. 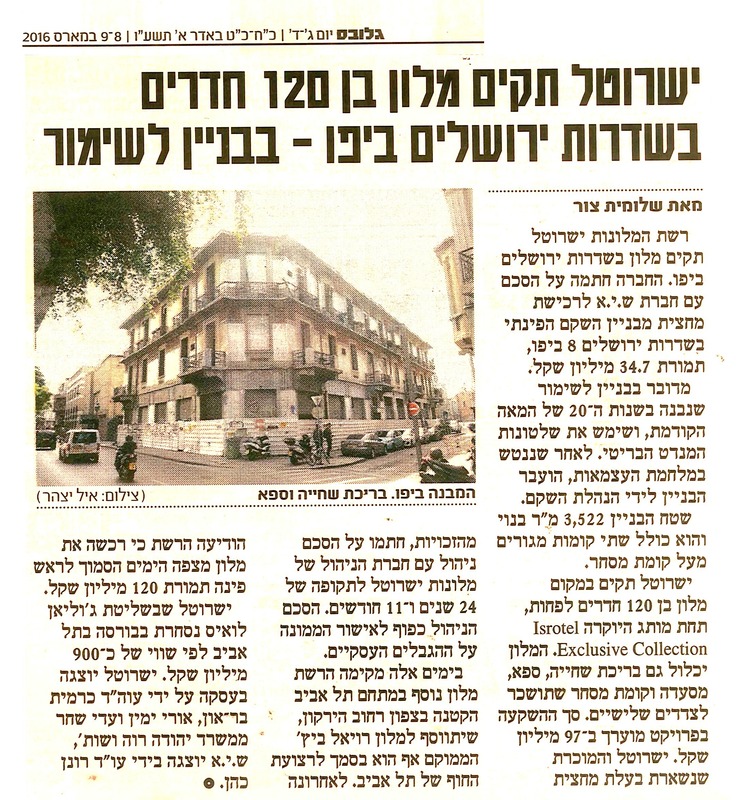 Carmit Bar On represented Isrotel in a transaction for the purchase of an iconic building at 99 Dizengof Street in Tel Aviv which will be converted into a hotel. Adv. 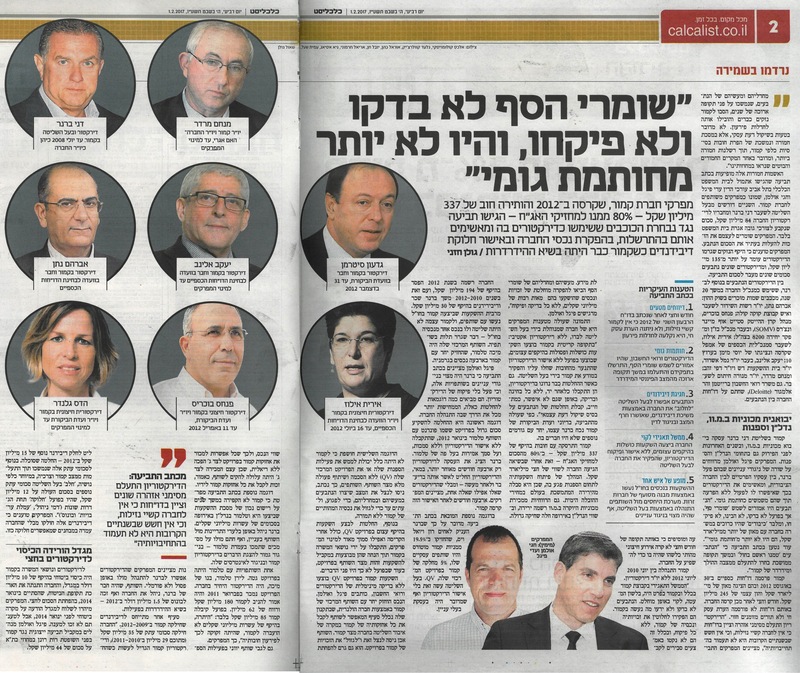 Carmit Bar On published an article in the publication of the Israel Hotel Association on the topic of "The Prevention of Sexual Harassments in Hotel Spas- What Prevention Measures Must Hotels Take?" 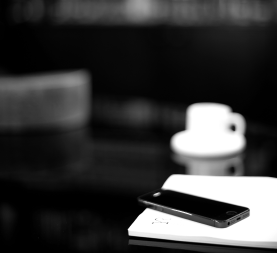 The Supreme Court accepted the position of the liquidators of Kamor Ltd., Adv. Chagai Ulman and Adv. Adi Figel, according to which a bank is not entitled to charge an early repayment commission where the early repayment is requested by the bank and not by the borrower. Adv. Ron Vered successfully represented Minrav Engineering and Nextcom in the “Emek Habacha” Project, to construct and provide operation and maintenance for 20 years for a 96 MW wind farms in Emek Habacha, Israel. 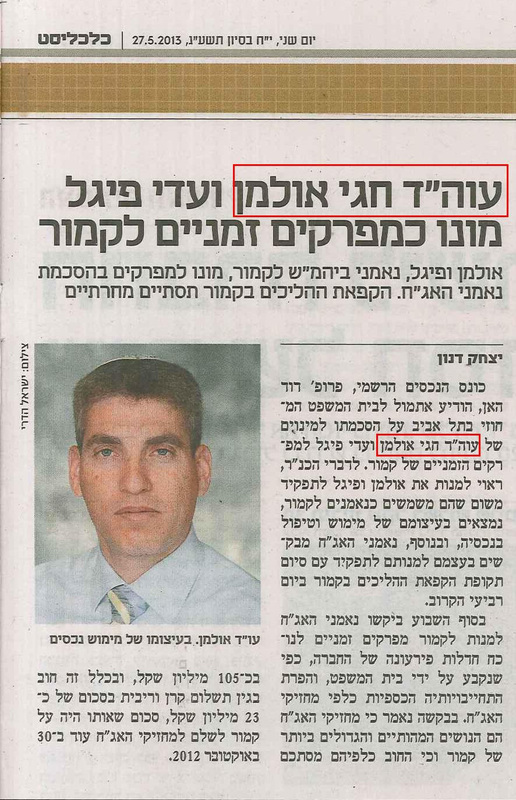 The President of the District Court in Tel Aviv appoints Adv. Chagai Ulman as the receiver of the real estate company of Eurocom. The President of the District Court in Tel Aviv approves the NIS 175 million settlement agreement in the derivative dividends claim submitted by Adv. 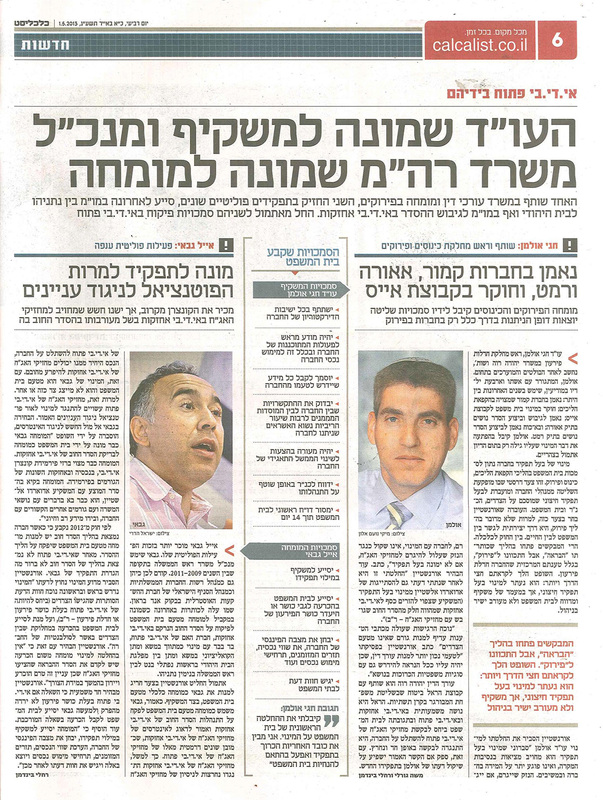 Chagai Ulman as the co-trustee of the IDB arrangement, regarding dividends distributed by IDB while under the control of Dankner. Yehuda Raveh & Co., celebrates Purim with a costume party, among the participants: Yehuda and Tami Raveh, Lisa Tross, Yuval Grayevsky and Chagai Ulman. ​The Project Finance and Infrastructure Department, led by Adv. Ron Vered, represented Enlight Renewable Energy and AMP Solar in financial closing of 53MW solar PV power plants. Adv. 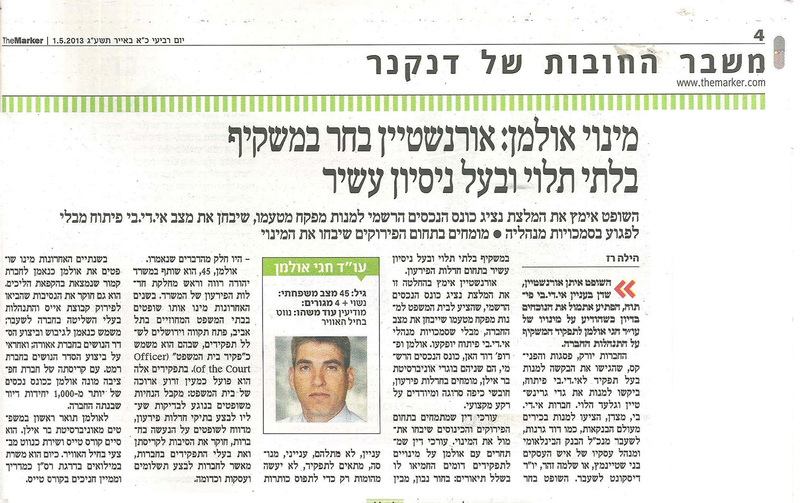 Adi Shachar published an article in the publication of the Israel Hotel Association on the topic of "Can the Management of a Hotel require an employee not to speak during work in any language other than in Hebrew?". The District Court in Haifa appointed Adv. Chagai Ulman as the Trustee for a real estate purchase group of more than 500 families in Harish. Adv. Chagai Ulman is quoted in connection with his representation of the debenture holders of the Alon Group “the fact that the company is transferred to the debenture holders is an historic and constitutive event in the laws of insolvency”. Adv. 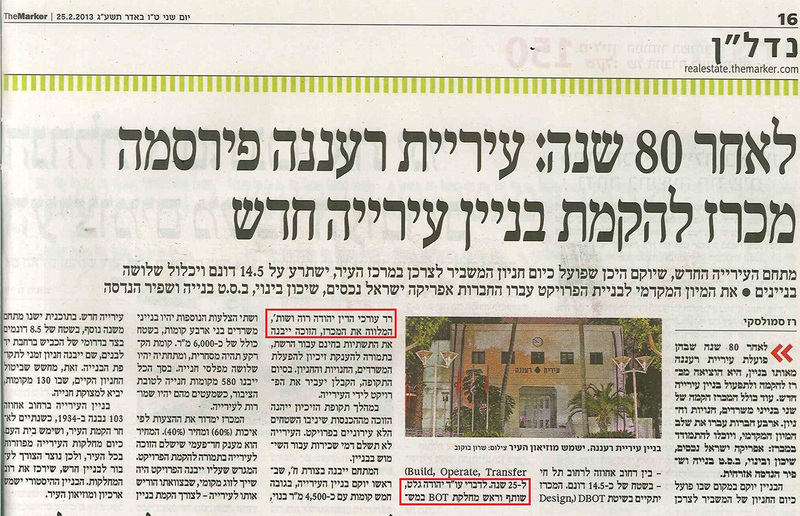 Carmit Bar on is quoted with respect to the recent campaign of the Tax Authority against unreported earning from short term rentals, following lobbying efforts Carmit coordinated on behalf of our client, the Israel Hotel Association. Adv. Yuval Grayevsky and Adv. Amit Dar together with Adv. Carmit Bar On successfully represented the hotel chain Isrotel Ltd. in the defense against a class action suit filed in the District Court of Tel Aviv regarding the lack of television subtitles for those with impaired hearing. The court dismissed the claim in a detailed decision. Adv. Ron Vered represented the Peninsula fund, of the Meitav Dash Group, in the financing of NIS 10 million for the purchase of Cleaning Hagalil 91 Ltd by Rani Keren and Kobi Motiv . 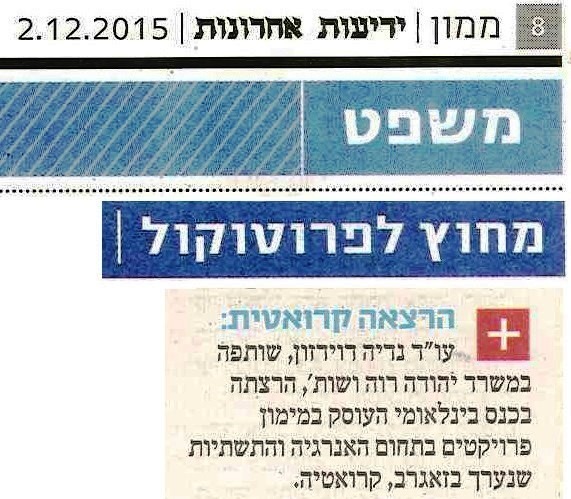 Yehuda Raveh & Co. is listed among the elite law firms in the field of insolvency debt arrangements. 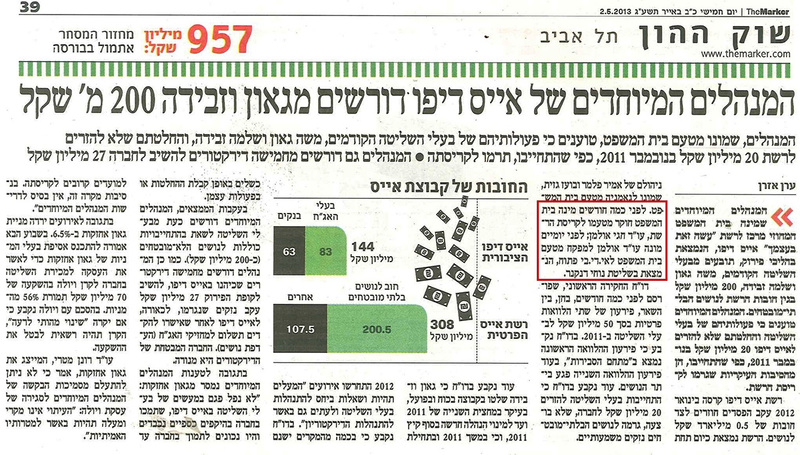 Yehuda Raveh publishes an article on B.O.T and P.F.I financing of municipality infrastructure projects. Item regarding the court proceedings with respect to the debt to the debenture holders of Alon Israel in the amount of more than NIS 1.8 billion, represented by Adv. Chagai Ulman and Noa Solomon, against the controlling shareholders in Alon Israel. Adv. Orly Kronman Dagan joins Yehuda Raveh & Co. as partner. Orly previously served as the Chief Legal Advisor and Corporate Secretary and Deputy General Manager of Phoenix Holdings Ltd. Orly will head the firm's Institutional practice. Adv. Chagai Ulman is quoted in an article regarding the Fishman insolvency case. Adv. Chagai Ulman, a joint liquidator of Kamor, files a claim against its controlling shareholders and former directors, in the amount of NIS 84 million. The court appoints Adv. Chagai Ulman as the company trustee of Yuval Building and Properties. Adv. 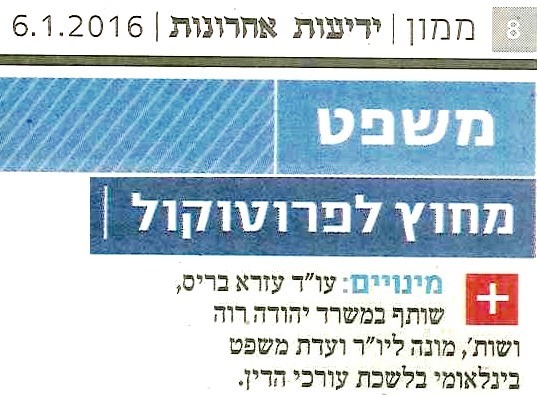 Chagai Ulman has moderated a conference on the new proposed Insolvency Law at the Tel Aviv University. Adv. Carmit Bar-On published an article in the publication of the Israel Hotel Association on the topic of "Cancellation Fees of Hotel Room Reservations in Distance Ordering". Adv. 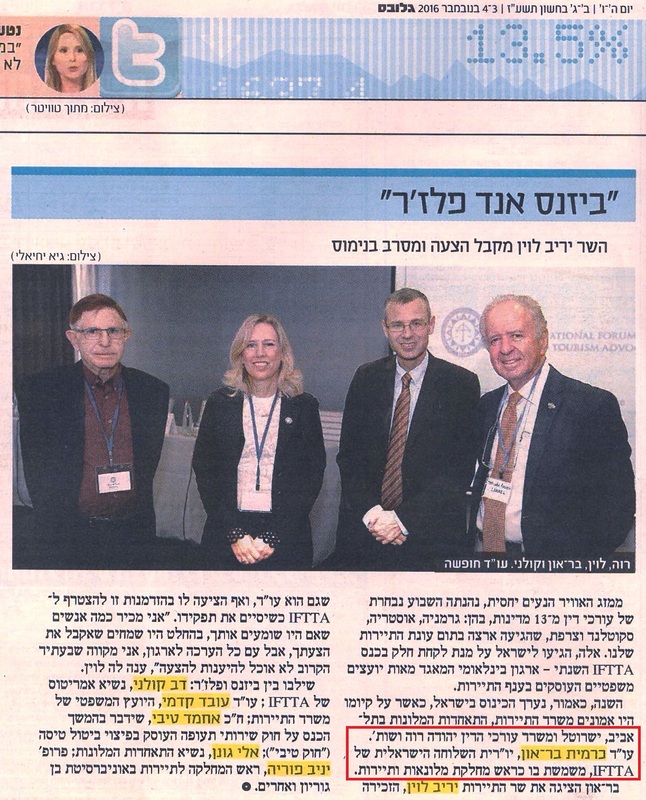 Carmit Bar On hosted and spoke at the annual conference of the International Forum of Travel and Tourism Advocates, of which she is its Israeli Chair. Other speakers at the conference included Adv. 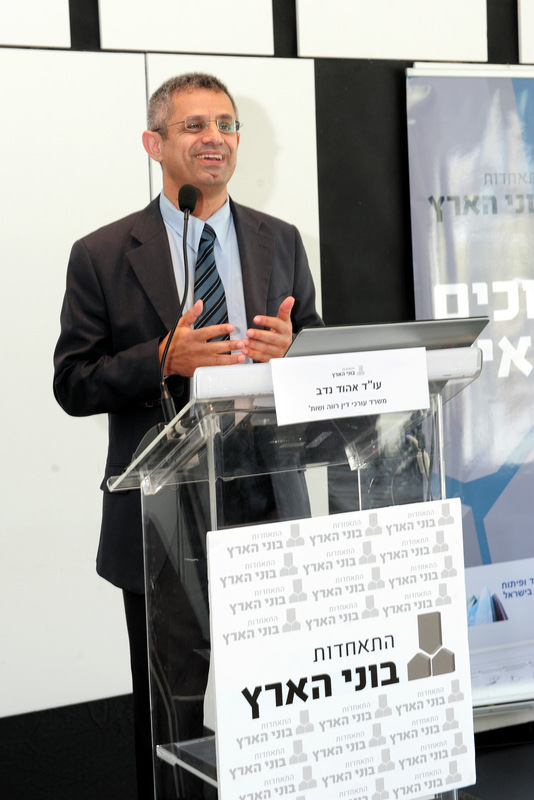 Yehuda Raveh, The Minister of Tourism and the Chairman of the Israel Hotel Association. Adv. Chagai Ulman will speak and moderate a conference on the new proposed Insolvency Law to be held at the Tel Aviv University. Adv. Adi Cohen-Bouganim and Adv. 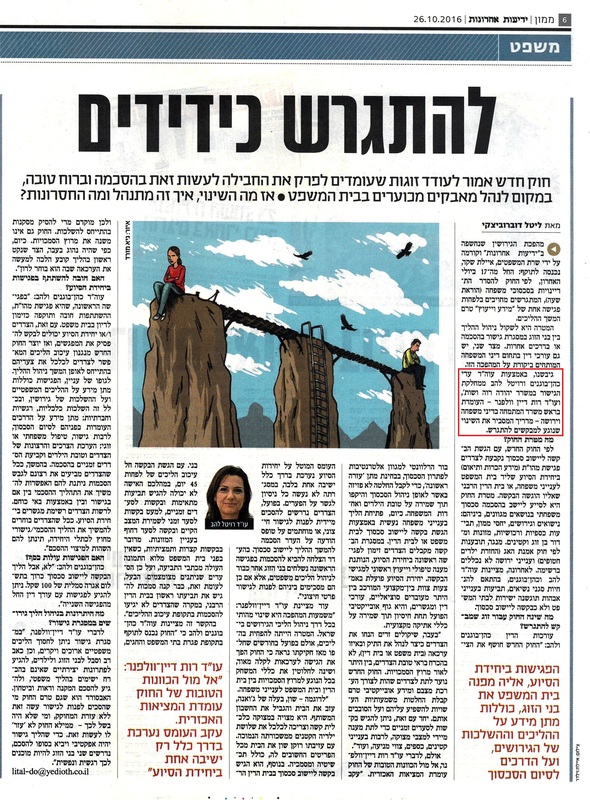 Revital Lahav, of the Firm's Mediation Department, are quoted in Yedioth Ahronoth regarding the new law requiring obligatory mediation for divorcing couples. Adv. Chagai Ulman and Noa Solomon represent Bank Leumi in the District Court in Tel Aviv in connection with motion for the Stay of Proceedings against Ortam Sahar Engineering. Adv. 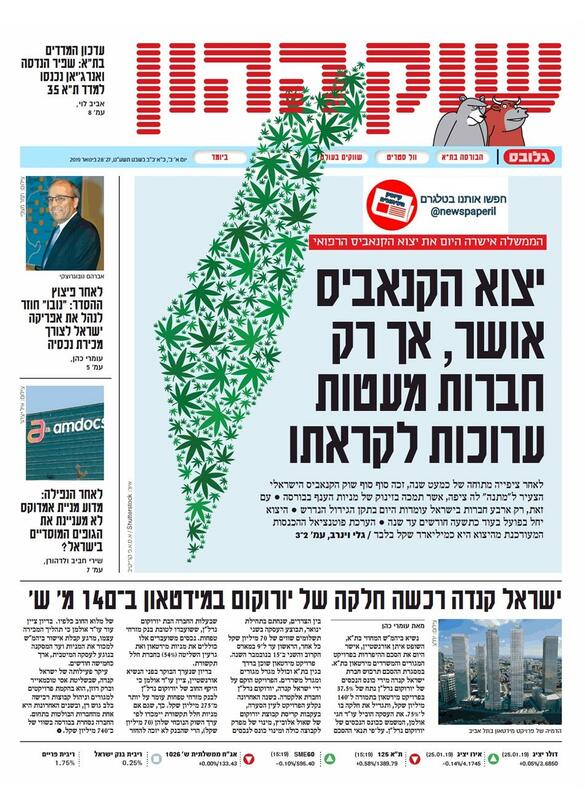 Chagai Ulman, the temporary receiver of the Adama Group, was appointed by the District Court in Tel Aviv as the special manager of the Adama Group companies and of the assets of its principal, Oren Kobi. Adv. Chagai Ulman and Noa Solomon represent the debenture holders in Alon Israel in their application to Court for a creditors' arrangement regarding a 1.8 Billion Nis. Adv. Ron Vered represented Bank Hapoalim and the group of institutional lenders in the financial closing of an independent gas fired power plant project of 140 MW adjacent to the desalination plant in Sorek (I.P.P. Delek Sorek of the Delek Group). Adv. Chagai Ulman is appointed by the District Court in Tel Aviv as the temporary liquidator of the Adama Group companies of Oren Kobi. Adv. 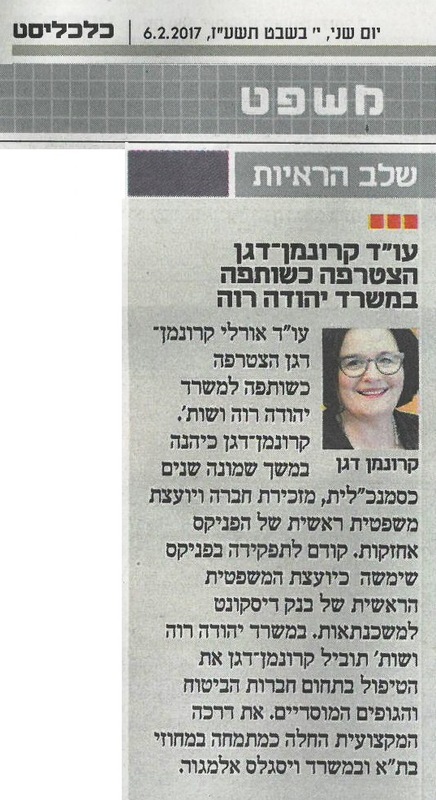 Shelly Gordon published an article in the publication of the Israel Hotel Association on the topic of "Negative Posts on the Internet regarding Hotels". Adv. 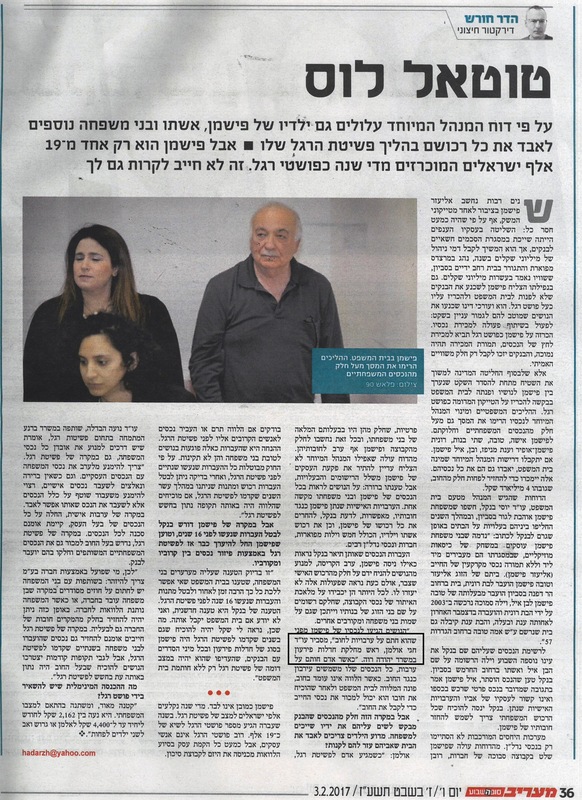 Chagai Ulman, the special manager appointed by the Court, recommends to liquidate the Adama Company of Oren Kobi and applies for a receivership order against Oren Kobi's personal assets. Adv. 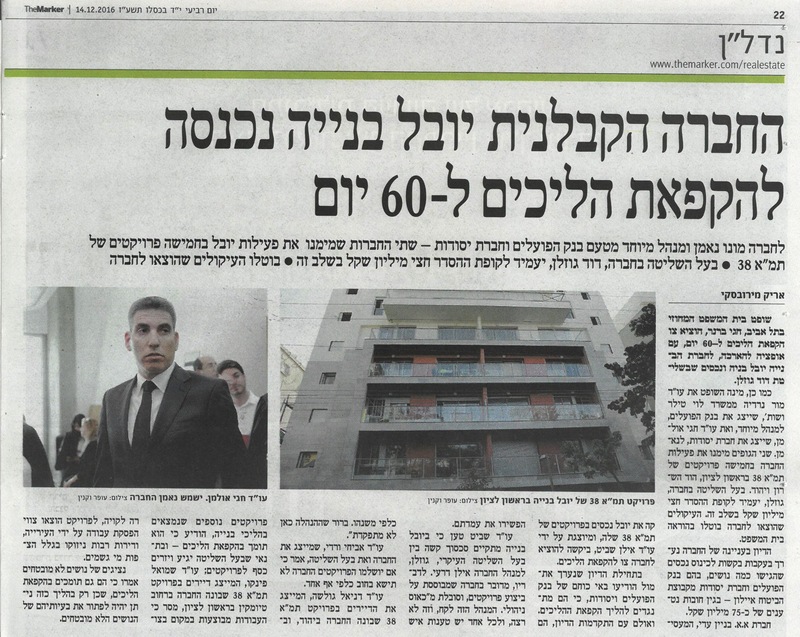 Chagai Ulman was appointed by the District Court in Tel Aviv as the special manager of the Adama company of Oren Kobi. Adv. Carmit Bar-On, Adv. Uri Yamin and Adv. Asaf Beck represented the Isrotel Hotel Chain in NIS 120 million transaction for the purchase of the Mizpe Hayamim Spa Hotel. Adv. Carmit Bar-On, Adv. Uri Yamin and Adv. Adi Shachar represented the Isrotel Hotel Chain in a NIS34.75 million transaction for the purchase of 50% of the rights in a building in Jaffa. Isrotel will develop a hotel in the building for its Exclusive Collection brand. Adv. Ezra Baris was appointed Chairman of the International Law Committee of the Israel Bar Association. Adv. Nadia Davidzon is interviewed in Globes and provides a legal expert opinion regarding a precedent set by the Supreme Court regarding the enforceability and assessment of a contractual arrears interest. Adv. 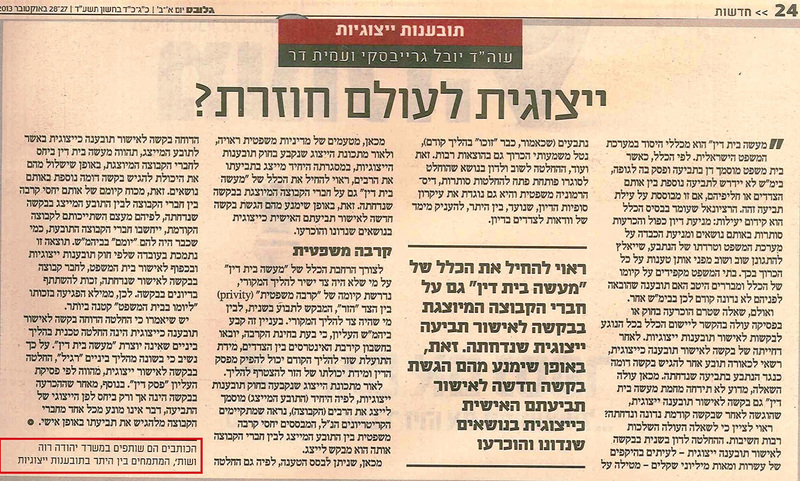 Carmit Bar-On published an article in the publication of the Israel Hotel Association titled: "Am I My Guest's Keeper?" on the topic of the liability of hotels with respect to the safekeeping of their guests' belongings. Adv. 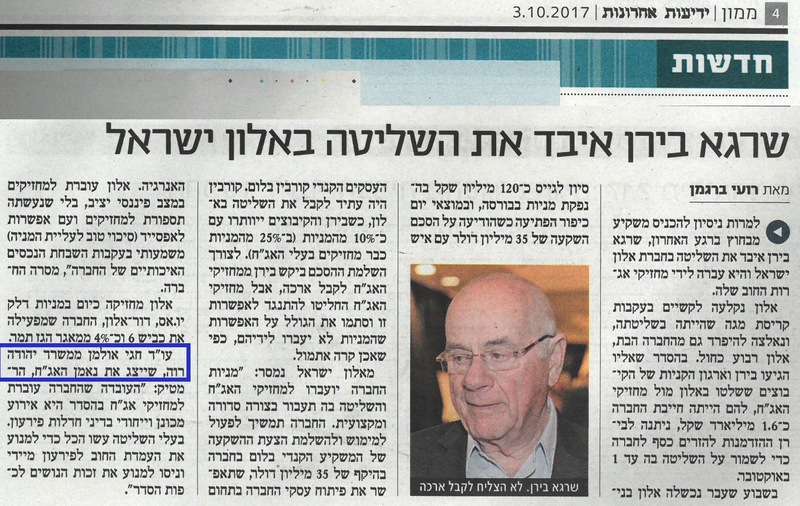 Ron Vered represented Bank Leumi in the financing of Haifa's New Bayport project in an amount in excess of NIS 600 million. Adv. Nadia Davidzon authors an article in Globes in the field of tender law ("Errors in the Tenders") regarding a new ruling by the Supreme Court regarding the validity of a bid submission containing deletions and corrections to the price proposal. 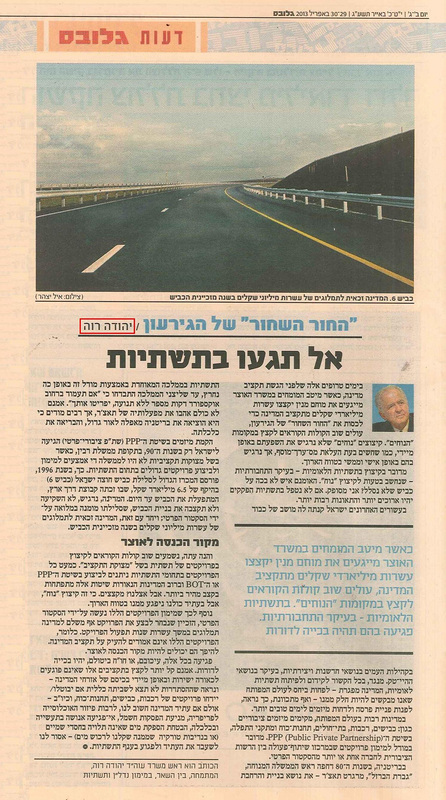 Yehuda Raveh authored a full page article in Globes entitled "The Continuing Infrastructure Failure in the Economy- Use the Israel Cross- Highway as an Example". Adv. Yuval Grayevsky and Adv. 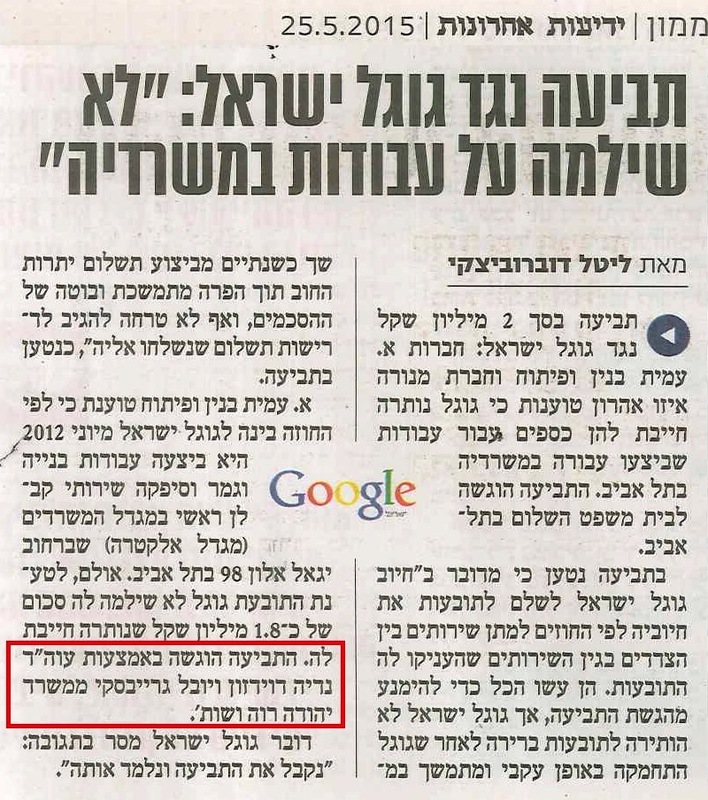 Nadia Davidzon represent Menorah Izu Aharon Ltd. and A. Amit Construction and Development Ltd. in claim against Google Israel for unpaid services. 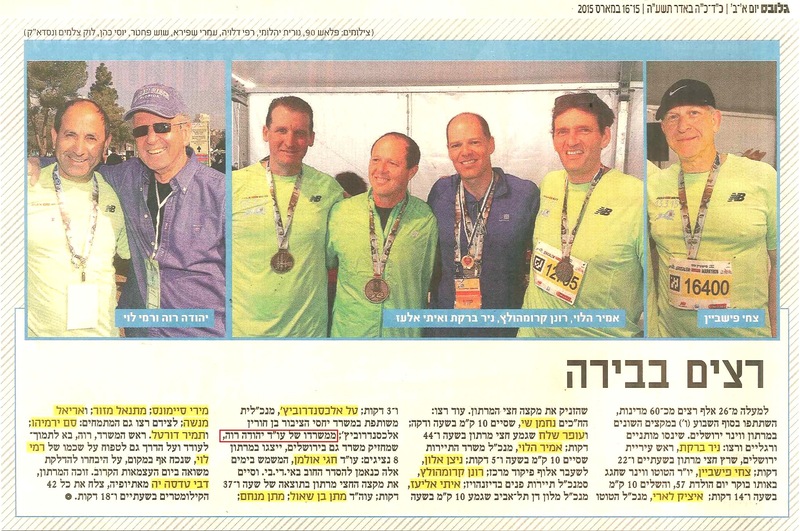 Firm participation at the Jerusalem Marathon is mentioned in Globes: Several members of the Firm participated in the annual marathon in Jerusalem. Adv. Ron Vered is interviewed regarding the issuance of an amended permit by the Minister of Economy with respect to doctors’ night shifts (see following link starting at minute 11:23). Adv. 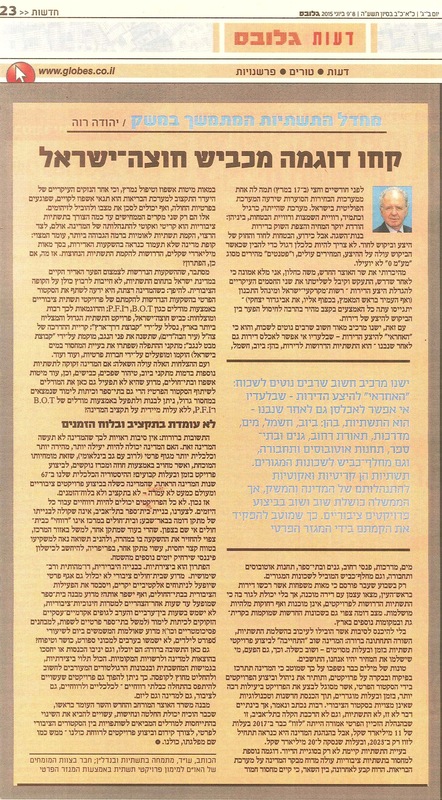 Ron Vered, comments in main news article in Globes in response to the issuance of an amended permit by the Minister of Economy with respect to doctors’ night shifts. In July 2014, Adv. 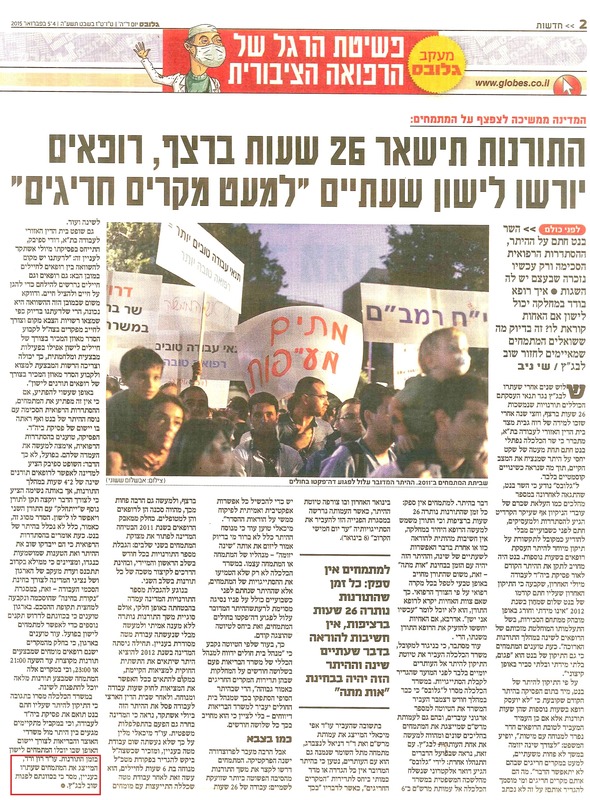 Ron Vered successfully represented a group of medical doctors leading to the groundbreaking ruling against the Government by the Regional Court in Tel Aviv regarding 26 hour work shifts. Adv. Carmit Bar-On publishes an article in “Hoteliers” the Journal of the Israeli Hotel & Tourism Industry (Israel Hotel Association) on the topic of the right to use the public areas in hotels. Chagai Ulman, Adv. and Noa Solomon, Adv. submitted an application to the court regarding the sale of Kamor’s assets in Europe, for NIS 52 million as part of the proceedings for the liquidation of Kamor. Chagai Ulman, Adv., the court appointed joint trustee of the IDB debt arrangement, objecting to a proposed rights offering in IDB. Adv. Carmit Bar-On publishes an article in “Hoteliers” the Journal of the Israeli Hotel & Tourism Industry (Israel Hotel Association) on the topic of selective enforcement of the law towards “Airbnb” apartment rentals as discrimination towards hotel owners. 100 employees of Yehuda Raveh & Co. toured Ashkelon and the communities surrounding Gaza, to celebrate the new year. Adv. Carmit Bar-on is interviewed on Globes TV on the topic of short term rentals and hotel regulations. 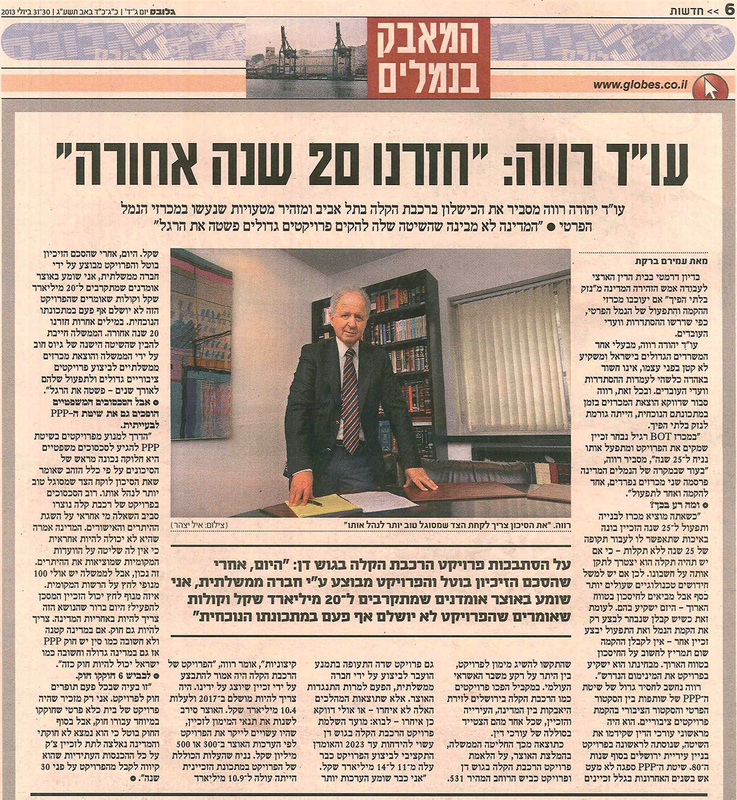 Yehuda Raveh appears on the front page of Globes, in an extensive interview, on the occasion of celebrating the Firm’s 40th anniversary. Adv. Ron Vered successfully represented a group of medical doctors in the Regional Labor Court in Tel Aviv achieving a groundbreaking ruling against the Government regarding 26 hour work shifts. Adv. 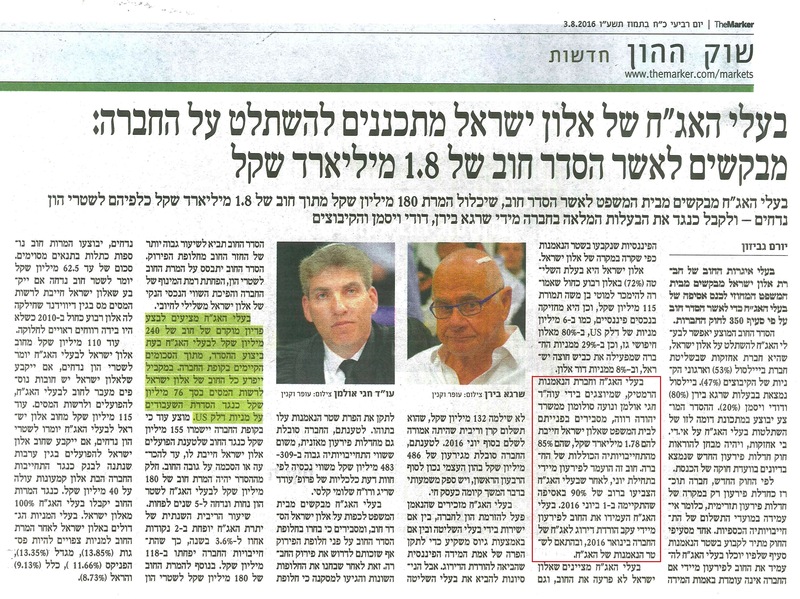 Ron Vered represented Bank Hapoalim in the financial closing of the Sorek Power Plant in the amount of NIS 600 million. Adv. 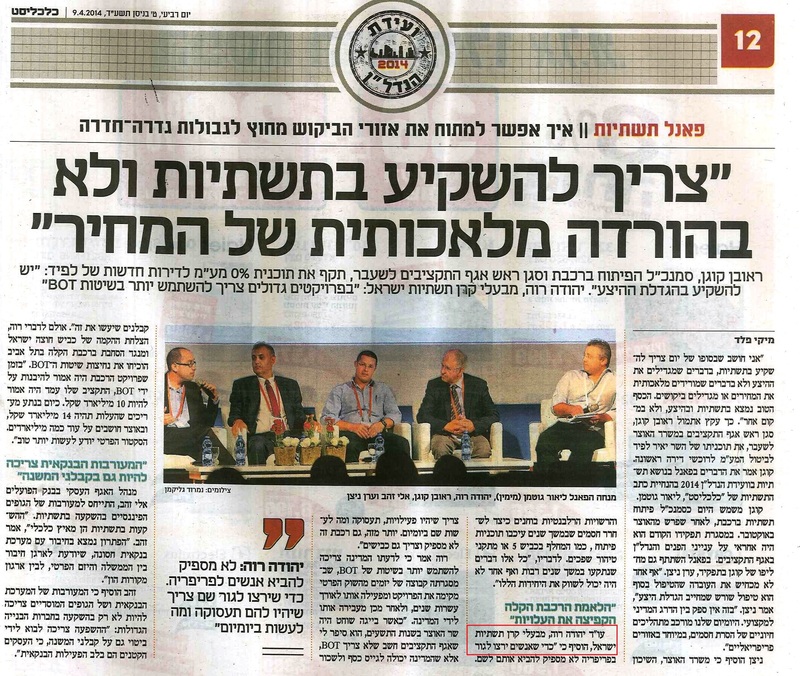 Yehuda Raveh spoke at the panel on infrastructure at the Real Estate conference held by Calcalist. Chagai Ulman, Adv., acting as joint liquidator of the shipping and real estate company, Kamor Ltd., successfully obtains an order from a court in the Netherlands blocking an attempt to takeover one of Kamor’s main assets. Adv. Yuval Grayevsky and Adv. Nadia Davidzon represent the IBI Group- a leading global architecture, planning, engineering, and technology firm- in the Light Rail Train Project in Tel Aviv. Amit Dar, Adv., is quoted by Calcalist regarding class action claims by Israelis against International Cartels. Yehuda Raveh & Co. is ranked # 8 in the country as a "Dream Work Place" in a survey conducted among lawyers seeking placement. 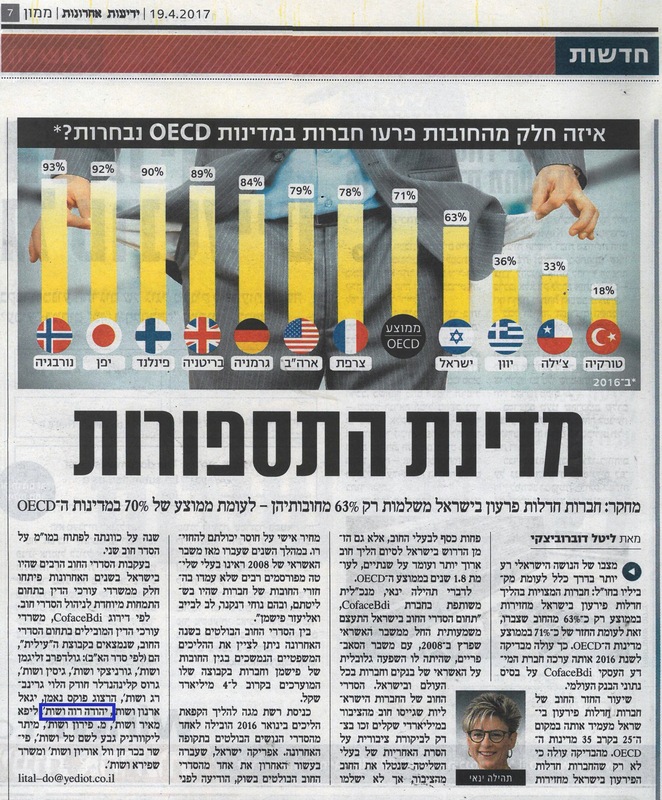 Yedioth Ahronoth notes the new website of Yehuda Raveh & Co.
Yehuda Raveh & Co. is ranked by Ifat Media Research, as having the highest exposure in the written press during 2013 among all law firms in Israel. 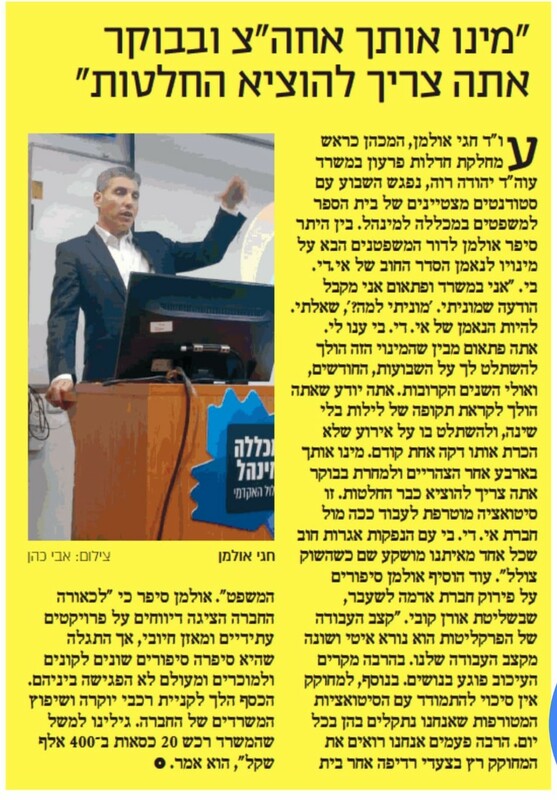 Ehud Nadav Adv., lectures at a tax conference held by the Israel Builders Association ("Boney Ha'aretz) regarding recent developments in the area of Advance Payments of Land Betterment Taxes. ‏ Chagai Ulman, Adv. 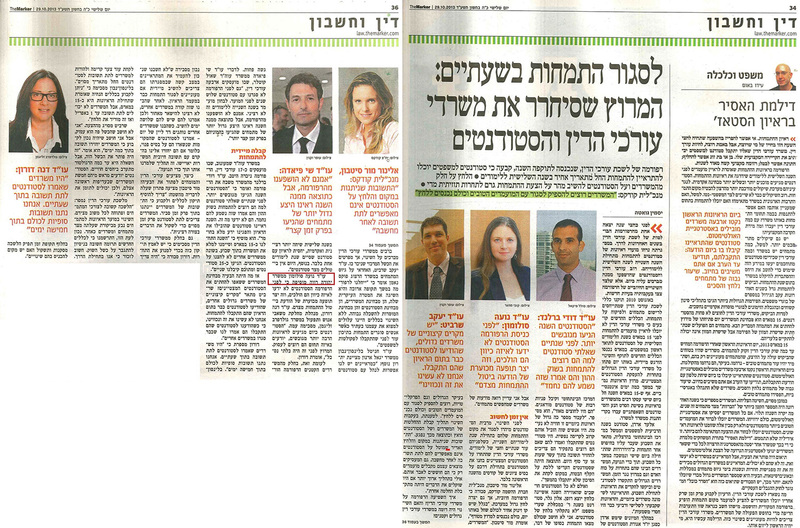 Is interviewed by Yedioth Ahronoth about his serving, during the past 8 months, as the court appointed observer for the IDB Group. Yehuda Glatt, Adv. represents the City of Ra’anana in a tender for the construction of a new City Hall building.